If you're not on Instagram, there's a big chance this post won't make much sense to you & that's really not all that bad for you. That means you're probably not trespassing by running into strangers' courtyards, taking pictures of your feet, floors & coffee cups, styling your food & standing on a chair in order to get the right shot, asking your kids or people around you to go stand there, run by, jump & a whole lot of other strange ideas. These are just a few of the activities this app has had me doing. And while it may not further world peace or have any meaningful impact on the planet by the end of the day, it's been a lot of fun. Last week though I took it one step further & played with Barbies. Yep. Dragged another (crazy) instagrammer with me who borrowed her youngest daughter's barbies & accessories & agreed to meet with me. I might have omitted to give that explanation to my husband though & just told him I'm going out to meet with a friend. As for the friend in question, she did tell her husband. From what I understand it was not a very successful conversation. The question you probably want to ask too is why? It's all Socality Barbie's fault really. Socality Barbie* is one of the funniest Instagram accounts I've come along in a long time. Created by a young, American woman who wants to stay anonymous, it makes fun of a lot of Instagram's cliches, but mostly the hipster West coast culture & all users of the hashtag #liveauthentic. If this doesn't ring a bell let me translate it into images of mountain-hiking, coffee-drinking, fog-chasing, clean-living persons, wearing the right shirts, glasses, watches, working as baristas & wood-workers & wrapped up in the famous Pendleton Blanket. And really she does have a point; what's so authentic about all wearing, visiting & writing the same thing? The real genius in all its simplicity is to make Barbie take the pose, the doll known all over the world for her perfect features & superficiality representing the "authentic" life. That being said, I felt targeted too by this account. I think a vast majority of Instagram users did - or at least I hope so. I'm definitely guilty of cliches & I've used hashtags such as #blessed, #explore or #simpleliving. What's been kind of funny & not so funny ever since I started following this account is that I've read & seen everything on Instagram through this filter, meaning that a lot of captions have made me laugh involuntarily. All of a sudden they just don't seem so authentic anymore. I've also had a real hard time writing my own captions because they all felt so cliche & superficial. But that's probably when funny is the best, when you're laughing first & then actually start thinking (thank you Barbie) & asking different questions: Why am I posting these pictures, what am I sharing & especially why do I want it to come across as so authentic, clean & simple? My easy answer is because most of our lives aren't like that so it's tempting to make them look better on social networks. At this point, I would have loved to make a long story short but it's too late for that. I will try however to get back to explaining what I'm doing playing with Barbie dolls in the streets of Paris although you're probably starting to get the picture. There's a lot of "authentic" living going on in Paris too. Some Paris accounts like to pose with macarons, croissants & other French pastries like they eat them all the time without ever gaining weight. Others pretend everything in Paris is pastel-coloured by carefully choosing their filters. Some lives seem to be all about picnics along the Seine, coffee dates at hip cafe places & romantic strolls through the parks of Paris & grabbing a Chanel bag on the way. Sometimes I get so tired of this romantic, girlish vision of Paris where we all pass by the Eiffel Tower 5 times a day & always make it to the perfect sunset. It was one of the reasons that made me start this blog & create an account on Instagram offering a different view on Paris. But to be honest (or authentic...), of course I don't post pictures of dog poo, garbage bins or other very real aspects of Paris. Nobody needs more ugliness in their lives. 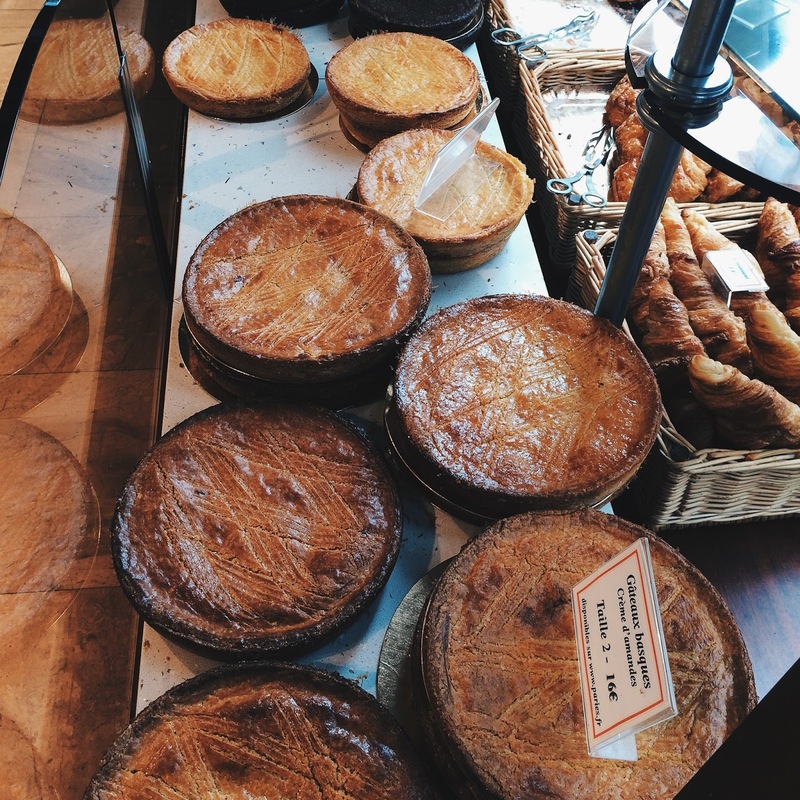 I just posted some pastry two day ago, & I like to stroll along the Seine and while trying not to live up to the idea of what is expected when living in Paris, I think it's impossible to be authentic on social medias. I think I would be kidding myself if I said I was. And maybe real authentic people don't use social media at all... But trying to be genuine & able to laugh at yourself are two things I value a lot in the accounts I follow. Sensing there's a real human behind with flaws & self irony, where not everything is perfect & where you can feel you have something in common, that's when Instagram starts making sense to me & becomes more than just a place where you can get inspiration to travel, cook, create. Because just like I don't need anymore ugliness in my life I sure don't need to be reminded that there are some worse control freaks out there than myself. Or perfect Barbies. As Aqua said in their Barbie song "Life in plastic - it's fantastic". Even the Eiffel Tower seems to agree (although it's really more a shot of Barbie gone wrong because we actually thought we could get you to think she's standing in front of the real thing #fail). And speaking of choux, this is were I realise that I have no category for this post. Starting to understand while most bloggers have one they call miscellaneous - would come in pretty handy at this moment & I might add one in the near future. Note September 2016: finally created a category named thoughts (please note I didn't call it deep thoughts). Till then I'm opting for the eat-drink-shop category with a few last pictures of Odette where Barbie sorry, we went to get some of their famous creamy puffs. We could have gone for macarons of course, but decided Barbie is a little bit more avant-garde in her choice of calorie intake. Choose between caramel, vanilla, coffee, pistachio, green tea, wild berries & more. Besides looking perfect on Instagram, they're actually edible & pretty good too. Odette - 77 rue Galande, 75005 Paris - Open 10.30am to 7.30 pm every day - One choux: 1,90EUR - One box of 6 choux: 9,90EUR - One box of 12: 19,80EUR. *The name Socality Barbie is inspired by Socality, a Christian organisation who according to their official website stands for "social community all for eternity". I don't think they find the account as funny as I do. Euskal Herria, Pais Vasco, Pays Basque... This region has as many names as personalities. It's both French, Basque & Spanish. It's the south, but on the Atlantic coast & near the Pyrenees mountains meaning the weather is completely unpredictable & you're never really sure which part of the world you're in. In the lapse of one single day you can get the feeling of being in Brittany or even Ireland & right after that in Andalusia. Heatwave, days of rain, Summer in November, prepare for everything when you pack & remember why it's as green as it is & why you'll see hydrangeas everywhere you look. In other words: if you're the kind of person that likes to go to the beach every day and work on your tan, this is not the right place for you. That being said, we stayed the whole month of July this year & only had one day of rain, to the point where I was actually overheard saying, exasperated "To the beach? Again?" But rest assured, this blogpost is not only a weather forecast (getting old...). There's a long list of reasons to go there: the food, the beaches, the waves (if you're a surfer), the mountain hikes & the stunning views they offer, the colourful villages, the proximity to Spain (I still love saying "Just going to Spain for some jamon, I'll be right back"), the authenticity, if that can still be said without sounding cliche... A million things to discover. These are some of my favourites. My all time favourite beach. If the pictures aren't enough, I'll tell you why. Miles of sandy beaches, not too crowded compared to other beaches in this area, good waves meaning there's always a surfers show going on when you're looking out on the sea. Every now & then you'll spot Michael Fassbinder, Vincent Cassel & especially Bixente Lizarazu surf here (well not me as I'm very nearsighted, but my husband will point out the famous dots in question to me) & then there are those beautiful white cliffs above you framing the scenery. Just because it won't be sunny everyday doesn't mean you can't have a hot chocolate while watching the surfers (& lifeguards). There's a little cafe right at the beach. And it's finally time to go home. There are plenty of small, lovely fisherman villages on the French Basque coast, but also some cities. One of them is Saint Jean de Luz. Sitting on a large bay shaped like the moon, it was once one of the most important fishing ports of France. It was also here that Louis XIV's wedding to Maria Theresa, the Infanta of Spain took place. Saint Jean de Luz also has a beautiful, white sandy beach, one of the quiet ones on the coast, protected from the waves, with plenty of activities & those lovely striped tents. It's also perfect for a long stroll when the sun sets. Besides its still active port & large beach, Saint Jean de Luz has a lot more to offer. Stroll around to discover its little hidden streets, pale pastel coloured facades, charming timbered Basque houses with the traditional red & green shutters, lovely cafes, fish restaurants, plenty of surf shops & boutiques selling clothes, local products & food. More on the food part later on in this post. And last but not least, let's not forget about the famous "Toro de Fuego" taking place twice a week on the central square Place Louis XIV & can best be described as two grown men dressed up as a bull lighting up with fireworks. Thousands of confetti can be bought as well & will be thrown around. Your kids' excitement over this will be inversely proportional with your joy of finding these little gubbins for weeks afterwards left all over your car & house. First of all "Gateau Basque", because you can't possibly go to the Basque Country without tasting this rich cake with a flaky crust surrounding a pastry cream or brandied cherries. You can also find other, less traditional variants - but just as good - such as a favourite of ours: all chocolate. Try the ones at Paries or Le Moulin de Bassilour. Then there's the "charcuterie", an absolute must in the Basque Country. I'm not saying you shouldn't come if you're a vegetarian, but propably try to keep it discreet... & expect to see a lot of hams hanging from the ceilings of bars & food shops. Jamon, chorizo... and a lot of cheese. The local brebis cheese served with black cherry jam is sliightly addictive & no apero platter is complete without it. To near perfection, we usually add a few sardines, a good baguette and some green & red pimientos (cherry pepper). Oh and rose wine of course, quite a lot of it, but we're flexible & a chilled white wine will do too. Another local speciality are Basques macarons from Maison Adam The shop is beautiful in itself & the boxes so pretty you hardly want to open them. Well that's not true because inside you will find what we call the real macarons, no offense to Laduree but these ones were invented in 1660 for Louis XIV's wedding & what's good enough for the king... Crisp & tender with a pure almond taste, go for one of the big boxes. Gaining weight by the minute here. Good thing for you I don't have any pictures of the Spanish pintxos & all the incredible ice cream makers. Let me just end with a last speciality of this region: chipirons. These small squids, often served a la plancha with garlic, parsley & lemon will almost make you go healhty, but fear not, most of the time they're seved with French fries. Same goes for the razor shells, another Basque shellfish delicacy. And let's not forget the foie gras. Tchiin! Coming up in Part II (next time I feel like inflicting you my post-holiday blues) : Biarritz, the French California, the annual "fetes de Bayonne", wild mountain horses & a look at Guethary, once a little fisherman village.